Do you ever wonder if your fingerprints mean something? Is there a deeper purpose than biometric identification? Similar to palm readings, I discovered possible links between fingerprint patterns and behavior patterns. Before I became an expert in fingerprinting, I thought we had the same ridge pattern on each finger that was an exclusively same pattern on every finger. I have since learned that fingerprint patterns are unique on every finger we have. Generally, we possess the same patterns in different variables on each finger. Rarely do we see people that have all three patterns and I love to point out how special and rare that is. Loop fingerprint patterns are the most common fingerprint pattern followed by whorls and arches are the least common. There are variables between those three main patterns as well. Sir Francis Galton, an anthropologist, was the first person to classify the different fingerprint patterns in his book published in 1892, which laid the foundation for use of fingerprints in criminal cases. Fun fingerprint fact: Identical twins have the same DNA but different fingerprint patterns. Fingerprinting has come a long way since 1892. Using the most recent technology, Livescan, is the most accurate method to collect fingerprint patterns. Gone are the days of the old-fashioned, and of course very messy black ink fingerprinting methodology. Livescan is the technology and method to collect fingerprints without using ink. This technology also allows fingerprint sites to directly submit fingerprints to the state and/or FBI bypassing the manual scanning of cards in the system which renders criminal history results much faster than the ink fingerprint cards. It is easy to lift your own fingerprints without buying expensive Livescan technology. All you need is a pencil, paper and scotch tape. Shade the pencil on the piece of paper and rub your finger on the pencil shading. Once you have a gray finger of graphite press the sticky side of the scotch tape to your fingerprint tip and pull off. Place sticky side down on a clean paper and voila! You have easily collected your fingerprint for review of your type of fingerprint patterns. You can view our video of this process here. Once you successfully complete the fingerprint challenge above, that will allow you to capture your own fingerprints, see if this fits your personality! Average aptitude with a pleasant even-tempered demeanor. Have strong opinions and respect others. Happy to go with the flow and are generally content in life. Make excellent partners and employees. Are easy going and happy to go with the flow. Not the best at being organized. Above average in intelligence, independence and have a dominant personality type. Much rather lead then follow. A whorl on the thumb reveals high intellect and a strong will. Whorls on both thumbs may indicate a controlling nature or lack of flexibility. Can be extremely intelligent, organized, exacting and controlling. A hand that has only one or two whorled fingerprints shows a bright, organized mind without the desire for perfectionism. Are analytical, practical and cautious. Have traditional values and do not like change. Can be difficult to get along with as they are very set in their ways. A career with a high level of methodology and little surprise suits someone with these kind of prints. Prone to anxiety disorders. Communication problems and may denote some speech peculiarities. Fingerprints that have double loop patterns are scarce and often is the sign of someone with a duplicitous nature. Those who bare this mark are known to be able to see both sides of an issue and also make good lawyers. Fingerprints are something unique to each individual and each finger, just like personalities! Another fun fingerprint fact: Koala Bears have fingerprint patterns so similar to human fingerprints they can often be hard to tell which fingerprint came from humans or koala bears! We hope you enjoyed learning more about fingerprints and patterns and how they may be tied to personality. Fingerprints are important for many reasons and it’s our mission at Fingerprinting Express to be the fingerprinting experts so you don’t have to! If you have questions about fingerprinting, have a need to get your fingerprints for a job or possibly a volunteer opportunity or maybe you’d like to get your children’s fingerprints down for your records, contact us. We are here to help! 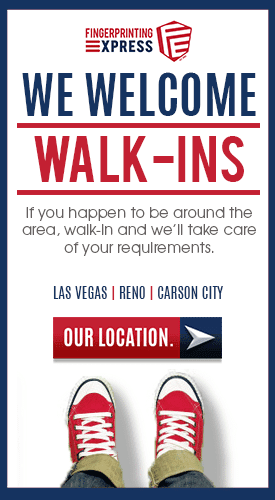 We offer secure fingerprinting services in Nevada, find a Fingerprinting Express location near you! This was written for entertainment purposes only and we are not experts in personalities. https://www.fingerprintingexpress.com/wp-content/uploads/2018/01/what-fingerprints-say-about-your-personality-FE.png 494 1030 Fingerprinting Express https://www.fingerprintingexpress.com/wp-content/uploads/2015/03/Fingerprinting_Express_Alt_Horizonal_Lockup_Color-small.png Fingerprinting Express2018-01-16 08:05:232018-02-26 11:46:01What Do Your Fingerprints Say About Your Personality?